The coreless induction melting is designed for melting and holding ferrous& non-ferrous metals . Our Induction melters with a melting capacity of 1 t/h to 50 t/h. Power range is from 25kw to 30000kw.Nowadays Induction melters are used to replace cupolas since the cupolas end to emit a lot of dust and other dangerous pollutants. 3:aluminum shell or steel shell furnace body is adopted with reasonable structure, convenient installation and simple maintenance, low maintenance cost. 7:Zero voltage starts up gently, high initial power, tiny impact on the electric network. Chapter 1: What is induction heating? 1.2: what is medium frequency induction melting furnace? Chapter 2: Types of Metal Melting furnaces ? Induction heating, also known as electromagnetic induction heating, is a method of heating conductor materials such as metal materials. It is mainly used for metal melting, heat treatment, welding and forging. The direction of the magnetic field depends on the direction of the current, so alternating current through the coil causes the magnetic field to change direction at the same rate as alternating current. 60Hz alternating current will cause the magnetic field to switch 60 directions per second. The 400kHz AC current will cause the magnetic field to switch 400000 times per second. When a conductive material (workpiece) is placed in a variable magnetic field (for example, a field produced by AC), a voltage (Faraday’s law) is induced in the workpiece. Induced voltage will lead to electron flow: current! The current flowing through the workpiece will be opposite to the current in the coil. This means that we can control the current frequency in the workpiece by controlling the current frequency in the coil. When the current flows through the medium, it will cause some resistance to the movement of electrons. The resistance is expressed as heat (Joule heating effect). Materials that are more resistant to the flow of electrons emit more heat when current flows through them, but it is certainly possible to heat highly conductive materials (such as copper) with an inductive current. This phenomenon is very important for induction heating. Conductive materials placed in magnetic field. The induction heating furnace produced by CDOCAST just adopt the electromagnetic induction to generate electric current inside the heated material and relies on the energy of these eddies for heating purposes. The basic components of induction heating system include induction coil, AC power supply and workpiece. According to the different heating objects, the coil can be made into different shapes. The coil is connected to a power supply, which provides alternating current for the coil. The alternating current flowing through the coil produces an alternating magnetic field through the workpiece, which causes the workpiece to generate an eddy current to heat. 1.2: what is intermediate frequency induction melting furnace? The charged metal material in the crucible is equivalent to the secondary winding of the transformer. When the induction coil is connected to the alternating current power supply, an alternating magnetic field is produced in the induction coil. The induction electromotive force is produced in the charge when the metal charging material in the crucible is cut by the magnetic wire. Due to the formation of a closed loop of the charge material itself, the characteristic of the secondary winding is only one turn and is closed. So the induction current is produced in the charge material at the same time. When the induction current passes through the charge, the charge is heated to promote its melting. The medium frequency induction furnace adopt the medium frequency power supply to establish the medium frequency magnetic field, causes the ferromagnetic material interior to produce the induction eddy current to heat, achieves the heating material goal. Induction heating is applied in medium frequency induction furnace with 200-2500Hz medium frequency power supply to Melt and heat preservation. Medium frequency Induction melter is widely used in smelting non-ferrous metals and ferrous metals. Compared with other metal melting equipment, IF induction furnace has the advantages of high thermal efficiency, short smelting time, less alloy element burning loss, wide smelting materials, less pollution to the environment, accurate control of the temperature and composition of molten metal. Fast smelting speed, good power saving effect, low metal loss and low energy consumption. Self-mixing function, melting temperature and uniform metal composition. A Metal Melting furnace refers to the facility that melts metal ingots & some scrap metals ,and adding the necessary alloy components, and smelting them into the required alloys by operation such as scrubbling and refining. Fuel heating : (including natural gas, petroleum liquefied gas, gas, diesel oil, heavy oil, coke, etc.) ,the reactive heat generated by comnustion of fuel is used to heat the charged metal. medium frequency induction melting machine, alternating magnetic field is produced by alternating current through coil, and the metal in magnetic field is heated by induction current. We choose different furnaces according to the different metals smelted and the final products we want to gain. According to different melting metals, the metal melting furnaces can be divided into 3 main types. High thermal efficiency with low operating cost ,Bigger melting capacity compared with the electric heating crucible furnace compared , high efficiency, low energy consumption, which completely eliminating the cost of replacing the electric heating elements. The Gas copper melting machine is especially suitable for areas with power shortage , so as to avoid the worry of power capacity increase due to the expansion of production. Induction copper melting furnace is mainly divided into (line-frequence cored induction furnace and medium frequency induction furnace). The line-frequence cored induction furnace can melt and heat the metal, the heating is evenly with no loss , which is convenient for adjusting the molten metal composition . However,line-frequence cored induction furnace melts cold material at a slow speed, is not conducive to slag formation, and requires a starting block for the start of the cold furnace. The production is not flexible enough, so it is generally used for remelting and heating of metals and alloys. In addition, the power frequency electric furnace has a low power factor, so a large number of compensation capacitors are required, which also increases the space and equipment investment. 1:medium frequency furnace has higher power density and higher productivity. In other words, the crucible size of the same power medium frequency furnace is only one third of the crucible size of the power frequency furnace. 2:Secondly, the intermediate frequency induction furnace can empty the furnace every time it smelts, so it is easy to change the varieties of the melted metal, which can melt quickly While the power frequency furnace requires some remaining molten metal in the furnace body. that means use the power frequency furnace can only melt one kind of metal. 3:Under the same productivity conditions, the medium frequency induction furnace has a smaller capacity, so it covers a small area, what is more, the medium frequency induction furnace consume less lining materials so has a low operating cost. 4:The reliability of intermediate frequency furnace is higher and the utilization ratio of equipment is improved. 5:Compared with the power frequency furnace, the intermediate frequency induction furnace has less stirring force, means has smaller metal lining erosion and longer lining life. silicon carbide melting furnace is one kind of resistance melting furnace. Resistance melting furnace is an industrial furnace that adopts the electric current to heat the electric heating element or heating medium in the furnace, so as to heat the charged material. It is a heating furnace that uses current to generate heat energy through resistive material. Resistance melting furnaces are widely used in the mechanical industry for heating metals before forging, heat treatment of metals, brazing, powder metallurgy sintering, calcination and annealing of glass and ceramics, melting of low melting point metals, drying of sand molds and paint coatings, etc. Easy to get high temperature when compared with fuel furnace. Can be heated from inside the material to make it warm up. Silicon carbide melting furnace is available to use in controlled atmosphere furnace and vacuum furnace. The resistance melting furnace does not have the exhaust heat loss of the fuel furnace, so the thermal efficiency is high. good operation performance, no pollution to the environment. After melting the scrap copper or brass in the smelting furnace, most people will prefer to cast the brass rods, brass bars, copper sheet, copper wire ..etc and other products,accordingly, we will choose different continuous casting machine to cast the types of copper products you want , thus there are mainly two tyeps of continuous casting machine in the market, horizontal brass continuous casting machine,and upward copper continuous casting machine. Horizontal /bronze continuous casting machine is mainly used for copper brass/bronze rod,pipe, sheet making.The materials can be pure copper/brass/bronze ,scrap copper/brass/bronze and other copper/brass/bronze materials. The principle of horizontal casting is a melting holding heating furnace with a graphite crucible warmed with very effective graphite immune heating elements heating system with a cooler, together with graphite die and cooler assembly and also go out track with withdrawal equipment as well as cut-off device. Molten metal flows from the crucible right into the graphite casting die which is cooled down with the help of an extremely reliable cooling jacket. Water-cooled graphite dies are connected horizontally to the holding crucible. Throughout the constant spreading procedure steel moves right into the graphite casting die where it solidifies. The strengthened strands are periodically taken out in a “pull-pause” series through withdrawal equipment. After leaving the graphite pass away, which is housed within the key cooler, the actors strands go through a secondary colder in the form of a water ‘sparge’ which eliminates the excess heat contained in the solidified billet. Water ‘sparge cooling’ past the exit of the die is a lot more thermal efficient compared to utilizing a graphite water-cooled sleeve colder. The oxygen-free upwards continuous casting machine is mainly used for producing bright and oxygen-free copper rods and copper flat strips. Raw materials are molten in the melting furnace, and the copper liquid is covered with coke and flake graphite to avoid oxidation. After melting process, the holding furnace keeps the copper liquid temperature at about 1150℃. The casting machine crystallizes the copper liquid quickly in crystallizer, and continuously output copper rods (copper flat strips).Upward Continuous Casting is new process of production for long length bright oxygen-free copper rod. It has the characteristic of high conductivity low oxygen content etc. After being further processed, these rod can be used as conduct material of electrical wire and cable magnetism wire and enameled wire, and also can be used in other electronic electric products. Medium frequency aluminum melting furnace is a new type of high efficiency and energy saving furnace developed on the basis of aluminum smelting technology. It can well meet the requirements of aluminum smelting technology, such as strict alloy composition, discontinuous production, large single furnace capacity, etc. It can reduce consumption, reduce burning loss, improve product quality, reduce labor intensity and improve labor bar. medium frequency aluminum melting machine is suitable for batch operation, with the melting of alloy and recycled materials. high availability, easy to change varieties. Gas-Fired aluminum melting furnace use natural gas (light diesel) as fuel, clean and safe, make workshop neat and clean, convenient to manage. High thermal efficiency, low operating cost and electric heating crucible furnace compared with the melting capacity, high efficiency, low energy consumption, completely eliminating the cost of replacing the electric heater. Adopt the international famous brand burners, so that diesel fuel combustion, exhaust emissions are completely free of pollution, multiple heat flow channel design, make full use of the energy generated by the burner, greatly improve thermal efficiency, energy-saving effect is remarkable. Avoid the worries short of stage of power capacity. Crucible aluminium melting machine is one of the most popular furnace nowadays ,this type furnace has the advantage of good insulation performance, rapid smelting, low production cost, pollution and other characteristics. 1. the crucible aluminum melting furnace has good thermal insulation performance, rapid smelting speed, low production cost, little pollution which can meet the environmental protection requirements. 2. Adopt resistance wire heating method, adopt high temperature resistance iron chromium aluminum resistance wire heating, the highest temperature can withstand 1400 C, because resistance furnace mostly equipped with crucible (graphite crucible or cast iron crucible, graphite crucible is mainly used for melting aluminum, cast iron crucible for melting zinc, lead tin, magnesium, etc. ), therefore, resistance furnace is also called crucible electrolytic furnace. 3. CDOCAST Aluminum melting furnace are constructed from high-quality refractories as well as insulation materials to ensure the maximum thermal insulation effect and service life of the furnace. This is the most direct way to reduce the production cost for customers. The effect of electricity saving is obvious. 4.Completely functional power distribution cabinets are equipped in the resistance furnaces .i. Distribution cabinet has the functions of over-heating and power-off of furnace wire, over-heating and power-off of liquid aluminum, SCR module control, stable operation, safe and reliable, PID system is used to control temperature. 5:Suitable for melting low melting point non-ferrous metals and alloys such as aluminum, zinc, lead, tin, magnesium, etc. Insulation furnace can be used for various kinds of die casting machine and mechanical hand side-to-side production equipment. Aluminum ingot casting machine were initially established in our own foundry mainly to deal with aluminium. An ingot casting machine needs to be exceptionally well built to make certain long life in a shop environment in addition to being quickly, efficient and 100% reliable. That’s an uphill struggle so we resource only the most effective spreadings and also elements and develop the frames in residence from top quality steel. Our pouring systems have been made to minimise dross development which subsequently significantly improves the ingots produced. A flexible speed system enables the quantity of metal poured into each mould to be properly managed, creating ingots of a consistent weight as well as dimension. As the moulds take a trip up the slope and around the head sprockets they invert, enabling the ingots to drop, aided by two hammers. There are a number of standard models which generate cones, dices or long bar ingot with ingot production capabilities from 5 to 10 tonnes a hr. Cdocast aluminum ingot casting makers can also be objective developed to satisfy your own factory’s needs. Metals are glossy, have good conductivity, thermal conductivity and mechanical properties, usually according to the color and properties of metals and other characteristics, will be divided into ferrous metals and non-ferrous metals two major categories. Ferrous metal mainly refers to iron and its alloys, such as steel, pig iron, ferroalloy, cast iron and so on. Metals other than ferrous metals are called nonferrous metals. Ferrous metals are collectively referred to as iron, chromium and manganese in industry. It also includes alloys of these three metals, especially alloy black metal steel and iron and steel. Nonferrous metals are relative to ferrous metals. Here are two main types of furnaces for smelting ferrous metals. Steel/iron Induction melting furnaces are very popular in steel mills and foundries. They are being used for holding and then smelting ferrous metals, sponge iron, nonferrous and many other steel scraps.They are used to replace cupolas since the cupolas end to emit a lot of dust and other dangerous pollutants.Medium frequency Cast iron melting furnace manufactured by COOLDO, have ideal multiple protection functions – over current;over voltage; insufficient water pressure; high water temperature; low voltage and phase loss. 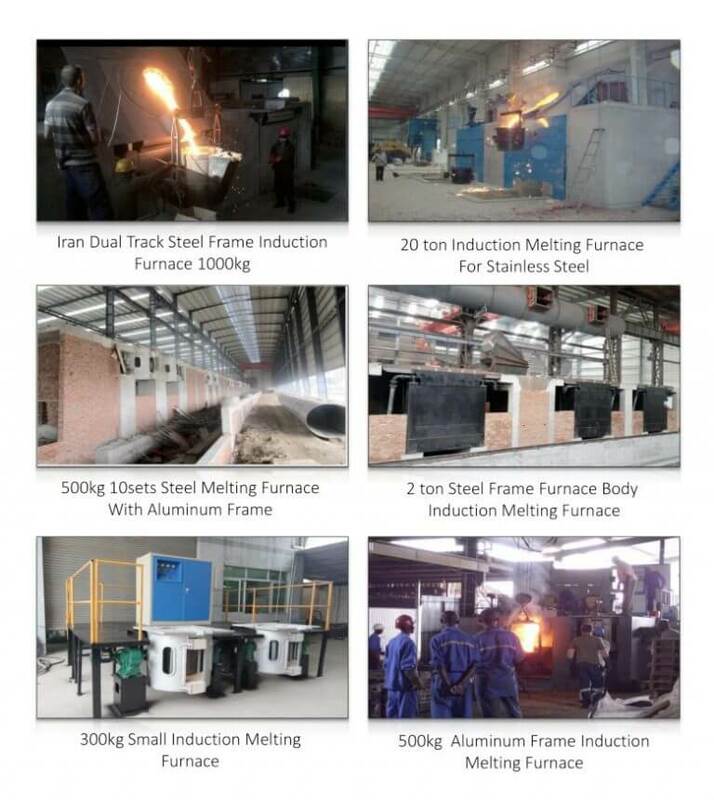 The advantages of our melting equipment are: high energy savings; low grid impact; high melting rate; small oxidation loss; uniformity of metallic composition; easily controlled temperature; excellent insulation qualities etc, And there are Types of Melting Furnace Body For your choice as Following. 2. Steel shell furnace general capacity is 0.3T—60T, circular aluminum shell furnace capacity is 0.15T—5T, square aluminum shell furnace capacity is 0.01T—0.15T. The unit capacity is calculated in 7.8 steel density. ④ The induction coil is not easy deformed in the protection of the magnetic yoke. The internal structure of square aluminum shell furnace and circular aluminum shell furnace is almost the same ， only different in external shape and tilting device. Circular aluminum shell furnace is widely used in reducer with furnace feet tilting; square aluminum shell furnace is manually tilting in general, hand wheel or lever. Click here to know the difference between the aluminum frame furnace body and steel frame furnace body. The cooling system mainly consists of two parts: power supply water cooling and furnace body water cooling. The power supply part includes various power supply devices in the power cabinet and electric heating capacitor group. Usually we suggest that the furnace body and power supply adopt independent cooling device. The medium frequency power supply adopts a totally closed water cooling tower and the furnace body adopts open type water cooling tower.. 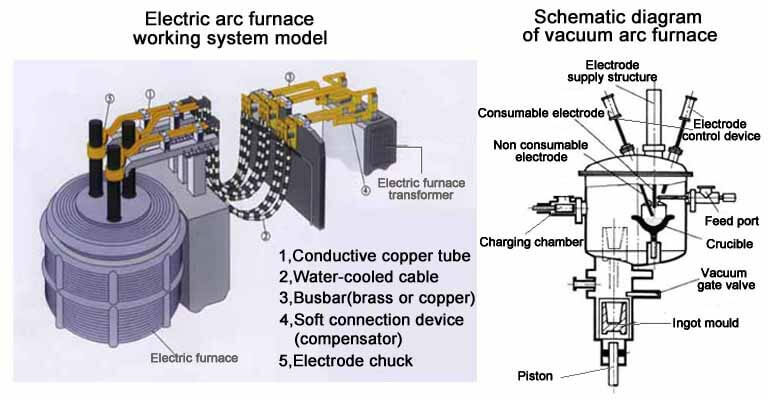 The purpose of adopting two independent cooling devices is to avoid mutual influence.Because the Medium frequency power supply needs low-temperature cooling water (pure water), the outlet water temperature should be controlled within 55 degrees C, but the cooling water temperature of induction coil can be slightly higher, which can improve the thermal efficiency of the furnace, what is more, it can reduce the volume of the cooling device, thereby reducing the cost. Turn on and turn off the smelter easily, and power failure will not affect the service life of electric furnace. Adopt constant power to control the circuit, maintain constant power while melting, and keep higher melting rate. Set up over voltage, over current and water deficient protector in the system to monitor the operation. The electric motherboard adopts CAD technology, integrated circuit board, low-fault-rate, easy-manipulating, effort less maintenance. Zero voltage starts up softly, high initial power, don´t impact on the electric network. Apply to melt ferrous metal and non-ferrous metal like copper, aluminum, zinc, steel, iron, stainless steel etc. Electric arc melting furnace for smelting ore and metal at high temperature using electrode arc. When the arc is created by gas discharge, the energy is focused, and also the temperature in the arc zone is above 3000. For heating metal, arc heating system is extra adaptable compared to other steel making process, can successfully remove sulfur, phosphorus and other pollutants, furnace temperature level is easy to manage, the tools covers little area, suitable for heating top quality alloy steel.Arc furnaces vary from induction heaters because the fee material is straight subjected to an electrical arc and the current in the heating system terminals passes through the charged metal product. Molten steel from Steel Melt Shop is to feed material for Continuous Casting Machine of Billets, Blooms as well as Rounds. These are after that sent to various Rolling Mills for succeeding Remso offer customizeded Continuous Casting Machine according on customer’s request & is made use of for continually cast plain carbon steel, reduced carbon, tool & high carbon, alloy steel and also stainless-steels right into the square Billet, Bloom, Bar, the sample of 80 × 80, 100 × 100 or 120 × 120, 150 × 150 mm with length of 6m/11m run by automated control system. We can supply solitary strand, dual hairs and also several strands CCM as well as straightening equipment, automatic cutting maker, billet air conditioning bank, billet spreader, liquified steel spreader and various other auxiliary devices and also facilities such as soft water therapy and also water air conditioning system. Precious metal melting furnace, usually small in size and atractive in design, our company’s rare metal melting furnace mainly includes the following. Cdocast Gold melting Furnace has steady Operation with Unbelievable melting speed. For the 1-10kg capacity, we recommended our Integrated type Small Gold melting furnace, this model is special designed for the beginner or jewlery shop who want to start the gold refinery business, this mini gold melting furnace with a power range from 5kw-15kw adjustable, The power supply adopt the IGBT technology from Germany, it is the newest technology with energy saving 30% compare to other melting method. graphite or ceramic crucibles will be choosen to meet different types of the metal, for the gold, silver ,copper, we will suggest use the graphite , while when melt the platinum , steel, stainless steel, we will suggest use the ceramic crucible. Temperature control system is optional for this small gold smelter. Please do not hesitate to speak to COOLDO today to see exactly how Induction melt could benefit your application. CDOCAST Platinum melting machine is a brand new product severally created by our company primarily applied in smelting the precious metal, such as, gold, platinum, palladium or the alloys of those steels. This precious metal smelting furnace can do a temperature of concerning 2600 degree during a really short time (regarding 900 centigrade beyond the rare-earth element temperature ). It embraces the foremost strong and also enduring quartz pot within the marketplace with a quick smelting time (within a pair of minutes). Cdocast silver melting furnace is designed especially for non ferrous metal melting like gold and silver ,copper with a capacity of 20-100kg. The resourceful building and construction brings the benefit for the tilting controller.The device set the tilting joystick with turning speed adjustment. The power use sophisticated IGBT innovation to understand energy saving as well as fast melting. It varies from 15kw to 90kw. The Simens PLC control is optional to satisfy your strict requirement.The Highly Qualified Chain Tilting Electric Silver Melting Machine with Lower power consumption, the IGBT innovation saves 15-30% energy than KGPS,100% complete full loading working Setup and maintenance are convenient, this silver melting furnace can be finished by video clip or our hands-on guide. It decreases the cost which you require pay for the engineers abroad for installment. Cdocast Silver Smelting machine is designed with multi-protective functions to over-voltage, over-current, less water, over-heating with reduced mistake rate and also is risk-free and reputable. pure graphite crucible is adopt for the silver melting , and it takes 1 minutes to change the graphite crucible,very convenient to use. CDOCAST Ingot Vacuum casting equipment are developed to make any dimension of ingots, from 100 g to 15kilo-bar either in gold or silver. You just need to place the pre-weighted gold/silver grains or powder into our custom-made graphite mould, and then placed inside the Vacuum melting chamber, during the solidification stage the ingot will certainly be cooled off accordingly by the personalized layout water cooling induction coil in the melting chamber. Throughout the entire casting procedure, the entire melting as well as cooling off process will occurs in a closed chamber, we have layout an automatic program which can vacuum the melting chamber automated, you simply press all-time low of vacuum, the vacuum cleaner process will certainly be automatic done within 5 mins, just what is more, inert gas like Argon or Nitrogen will certainly be filled in the melting chamber which could prevent the silver or gold from Oxidation. 1: What is induction heating? 2: Types of Metal Melting furnaces?